Holidays don’t necessarily mean summer resorts or picturesque villages. Cities have their own share when it comes to summer time, let alone if they are located on one of the most beautiful Greek islands. Argostoli is a top-notch destination if you like cities and you would like to combine the hustle and bustle of city life, vivid nightlife and shopping with the Greek sun, ice-cold coffees in lovely cafes and enchanting beaches. It is the biggest city of the island and it has been its capital since 1757, the year it was actually founded. It is built amphitheatrically and even though the earthquake in 1953 destroyed the entire city, there are still parts that resemble the architecture of the old city with the typical Venetian mansions. If you decide to stay in Argostoli for your holidays, it’s needless to say that you will find all sorts of accommodation, including luxurious and budget hotels as well as rooms to let. There is no chance of getting bored in Argostoli as the city is lively year round, with a lot of shops, cafes and bars mostly found in Lithostroto, the pedestrian street near the main square. If you head to Lithostroto for a drink in the evening, you might get lucky enough to come across the local band playing traditional Kefalonian songs and filling the atmosphere with rhythmic and soft sounds. On the other hand, if you would like to finish your night with something romantic, then take a stroll along the promenade. It is lined with palm trees and paved with pebbles from the beach. On the other hand if you happen to be there in the early hours after a long night out in the local clubs, you will see the local fishermen bringing freshly caught fish to supply the small 'tavernas' at the end of the promenade and the rest of the restaurants in the city. Feel free to have a small lunch with ouzo and “meze” – the Greek version of tapas. Apart from the main square there is also the Campana (bell in Greek) square where the bell tower which the square was named after is located. Go on the top of the tower to see the panoramic view of Argostoli and take a look at the photo exhibition to find out what the tower, Lithostroto and the whole city used to be like before the earthquake. The café “The Bells” is a traditional café but it belongs to the ROTA Cooperative which means that they employ people with disabilities. From here you could also buy scented herbs and locally made sweets. For those of you who would like to become more acquainted with the history and the culture of the city, the Archaeological Museum and the Korgialeneios Library are highly recommended. In the first one, important archaeological findings from different sites around the island are exhibited, whereas in the second one, there is a rare collection of books and manuscripts. The Library also operates as a folklore museum and therefore exhibits from the everyday life on the island, especially in the past, are on display. Another important site in Argostoli is the ancient city of Krani which was one of the four more powerful cities in the ancient times. Among the ruins are parts of the walls of the ancient city which are known as the Cyclopean Walls because of their size. De Bosset bridge is part of the more recent history of Argostoli as it was built during the British occupation. It was named after the governor of Kefalonia, DeBosset, who served at the British Army. Until present day the bridge connects Argostoli with the other side of Koutavos Lagoon, but cars have been banned in order to avoid heavy traffic and damages of the bridge. The benefit of the cities on the islands is that you have everything at hand and the beach is in short distance! Near Argostoli there are the sandy beaches of Makris Gialos and Platis Gialos. These are two of the most popular and well-organised beaches of Kefalonia. There are rows of sun loungers and umbrellas if you like this kind of beach facilities, but you will probably be able to find a spot away from them as well. There are other beaches in the area, such as Gradakia and Kamaroules. For more options the city is linked to Lixouri and its reddish, more secluded beaches with daily ferries running every hour in the high season. Two things worth mentioning about Argostoli is the one of a kind geological phenomenon, called Katavothres, that takes place here and the appearance of loggerhead turtles in Koutavos lagoon. Katavothres is like an underground system through which the sea water travels from Argostoli all the way to Melissani Cave in Sami. Loggerhead turtles have chosen several beaches on the island to lay their eggs, but there is one turtle in the lagoon that is particularly friendly and enjoys greeting people by popping its head out of the water. It even has a name and has become the attraction of the lagoon. 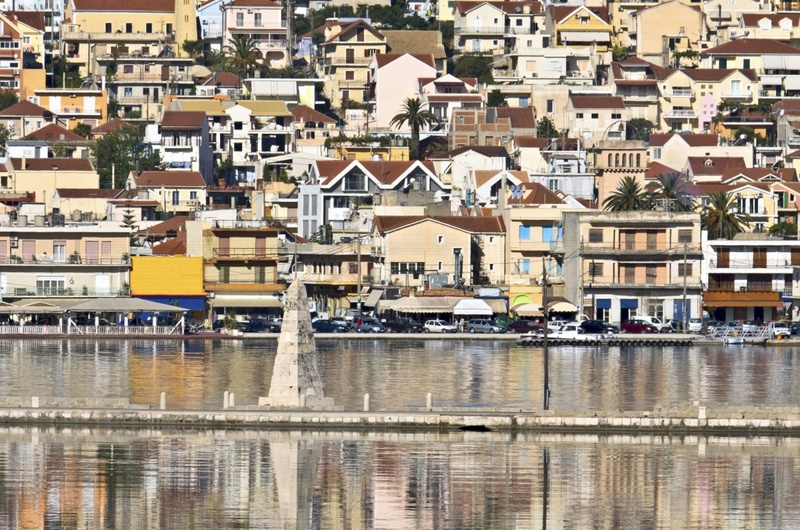 Even if you don’t like cities, you will probably change your mind after visiting Argostoli! Find information about selected Hotels, apartments and rooms in Argostoli to choose the perfect place for your accommodation.